Life is difficult. This is the first line of M. Scott Peck’s book, The Road Less Traveled. Life is difficult, and love sometimes seems an unobtainable dream in the disappointments, pitfalls and disparities of life as it wears on. Broken hearts. Broken promises. Unrealized dreams. Unforeseen calamities. Unbearable trials. Painful seasons. Haunting Regrets. Betrayals. Sedentary Relationships. All have their ways of extinguishing the dream of love. The picture posted above is from our basement wall. 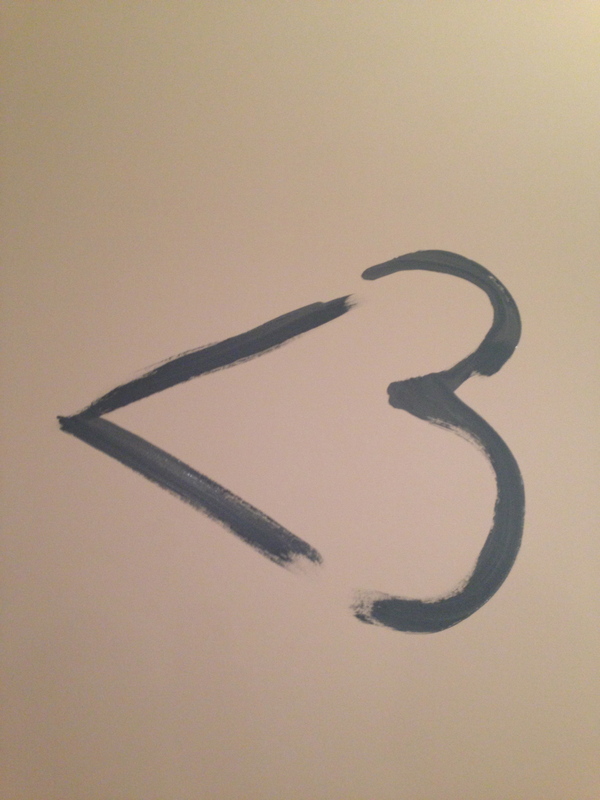 Katherine and one of our daughters had left the house to me while I painted, and to signal to them that the work had begun, I painted the now-famous heart – the less-than-three sign. Once that went on the wall, the commitment was made. Someone had to slosh the walls with blue. Our instinct is to do the opposite. Whenever disappointment threatens, we tend to insulate ourselves against fresh experiences with pain. We say and do harmful things to protect our fragile hearts. We force ourselves to be cold and uncaring. Love is the last thing we want to risk our vulnerabilities on because we are never more exposed than when we open our hearts to the possibility of their being broken. I get that. Life is difficult and Love is terrifying. Who has room for Love and all the mess it brings? But it is also what we most yearn for. To love and be loved. And someone has to make the first move. Someone has to start painting. Let it be your prompt to love those who may be hiding from you behind their own self-protections, though every bit as terrified. Start painting. Forgiveness, tenderness and vulnerability are scandalously risky. We know. Jesus went there for us. Trust me, Love is the first stroke. He knew the risks when He opened His mouth to call the disciples His friends. Amazingly, to Him they were worth it. …risky indeed; hard; who would do this? He would. He did. thanks Mike – I love you, you are my dear friend – May God continue to bless you and yours! As usual Mike God ,through you, has reached into my heart .It is on point as we celebrate holidays with family …the worst of times and the best of times. Love to you and Katherine . You are currently reading Love @ Thanksgiving at unfinished1.